This entry was posted in Managing risks & hazards on 2017/05/10 by Susan. Our state of mind influences how we drive. 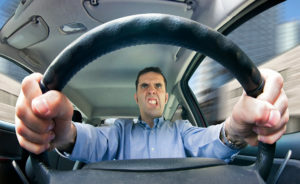 Driving while angry, for example, is well-known as a bad idea. Just look at all the crazy road rage videos on YouTube! But even less intense emotions – like irritation and agitation – have an effect on our driving, as well as on anything else we do. Same goes with our thoughts. If we get caught up in them, we can lose our focus, which can be deadly on the roads. Doing a “self-check” is one way to focus before getting behind the wheel. That’s what Rick Walters advises. He’s the fleet safety program manager for Road Safety At Work and he’s leading a session, Managing Driving Stress, at the 2017 Upper Island Safety Conference (May 29-30) in Campbell River, B.C. In the past, Rick was a professional driver who covered more than two million kilometres on B.C.’s roads, many of them during his 10 years hauling logs in the Interior. Now he’s working with the Road Safety at Work team, whose goal is to reduce driving-related injuries and fatalities. Motor vehicle crashes are a leading cause of traumatic workplace fatalities. On average, 20 people die in work-related motor vehicle crashes in B.C. every year. Another 1,260 are injured and miss time from work. Employers of people who drive during a work shift have legal obligations to ensure the safety of their employees while they are driving for work purposes. See the Essentials of a Road Safety Program for more information. At the Upper Island Safety Conference, Rick will demonstrate TripCheck, a journey management tool that drivers can use to plan and prepare for journeys that minimize driving-related hazards. He’ll also show Driving for Work: The Journey Management Process, a WorkSafeBC video, which you can watch below.